Candied Flower Petals (sugared flowers) with no egg whites! Have you ever sugared petals?? Easy! And, they are soo gorgeous! Candied flower petals are a fabulous way to take your homemade cake from ordinary to extraordinary! They are simple, easy, and use very few ingredients. Pull your petals apart. Be sure to use organic flowers that haven’t been sprayed with pesticides. Give them a gentle wash in cold water. Let them dry completely and use the right away! Brush them with beaten egg white or simple syrup using an artist’s paint brush. Sprinkle them with fine sugar. The finer the sugar, the better! Let them dry on a baking sheet overnight. If you are rushed you can turn the oven on to low, put them in the oven. Then shut the oven off and open the door.They keep for weeks in a dry, closed container. These are fabulous for decorations of all kinds!! Seriously…don’t pay for this stuff anymore!! 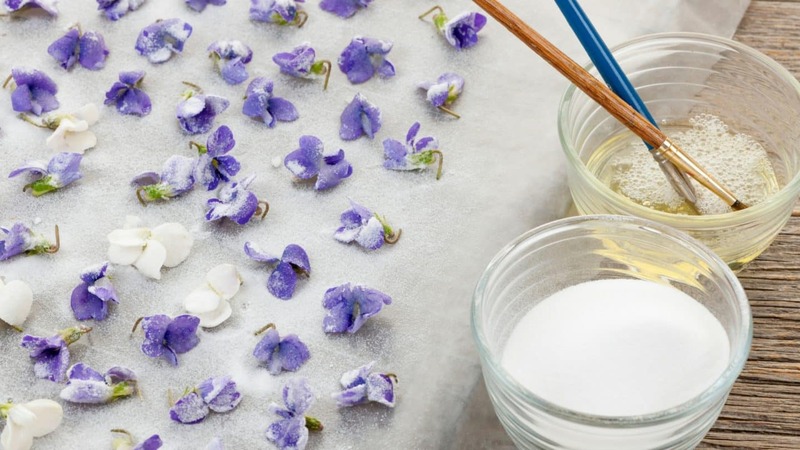 It is best to remove the stems and stamens from the flowers because some are allergic to the pollen except for pansies, violets, honeysuckle, and a few others.